For the journal, see Bioinformatics (journal). Bioinformatics /ˌbaɪ.oʊˌɪnfərˈmætɪks/ ( listen) is an interdisciplinary field that develops methods and software tools for understanding biological data. As an interdisciplinary field of science, bioinformatics combines biology, computer science, information engineering, mathematics and statistics to analyze and interpret biological data. Bioinformatics has been used for in silico analyses of biological queries using mathematical and statistical techniques. Bioinformatics has become an important part of many areas of biology. In experimental molecular biology, bioinformatics techniques such as image and signal processing allow extraction of useful results from large amounts of raw data. In the field of genetics, it aids in sequencing and annotating genomes and their observed mutations. It plays a role in the text mining of biological literature and the development of biological and gene ontologies to organize and query biological data. It also plays a role in the analysis of gene and protein expression and regulation. Bioinformatics tools aid in the comparison of genetic and genomic data and more generally in the understanding of evolutionary aspects of molecular biology. At a more integrative level, it helps analyze and catalogue the biological pathways and networks that are an important part of systems biology. In structural biology, it aids in the simulation and modeling of DNA, RNA, proteins as well as biomolecular interactions. Historically, the term bioinformatics did not mean what it means today. Paulien Hogeweg and Ben Hesper coined it in 1970 to refer to the study of information processes in biotic systems. This definition placed bioinformatics as a field parallel to biochemistry (the study of chemical processes in biological systems). Computers became essential in molecular biology when protein sequences became available after Frederick Sanger determined the sequence of insulin in the early 1950s. Comparing multiple sequences manually turned out to be impractical. A pioneer in the field was Margaret Oakley Dayhoff. She compiled one of the first protein sequence databases, initially published as books and pioneered methods of sequence alignment and molecular evolution. Another early contributor to bioinformatics was Elvin A. Kabat, who pioneered biological sequence analysis in 1970 with his comprehensive volumes of antibody sequences released with Tai Te Wu between 1980 and 1991. The primary goal of bioinformatics is to increase the understanding of biological processes. What sets it apart from other approaches, however, is its focus on developing and applying computationally intensive techniques to achieve this goal. Examples include: pattern recognition, data mining, machine learning algorithms, and visualization. Major research efforts in the field include sequence alignment, gene finding, genome assembly, drug design, drug discovery, protein structure alignment, protein structure prediction, prediction of gene expression and protein–protein interactions, genome-wide association studies, the modeling of evolution and cell division/mitosis. Over the past few decades, rapid developments in genomic and other molecular research technologies and developments in information technologies have combined to produce a tremendous amount of information related to molecular biology. Bioinformatics is the name given to these mathematical and computing approaches used to glean understanding of biological processes. Bioinformatics is a science field that is similar to but distinct from biological computation, while it is often considered synonymous to computational biology. Biological computation uses bioengineering and biology to build biological computers, whereas bioinformatics uses computation to better understand biology. Bioinformatics and computational biology involve the analysis of biological data, particularly DNA, RNA, and protein sequences. The field of bioinformatics experienced explosive growth starting in the mid-1990s, driven largely by the Human Genome Project and by rapid advances in DNA sequencing technology. The sequences of different genes or proteins may be aligned side-by-side to measure their similarity. 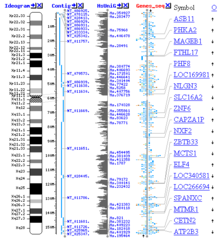 This alignment compares protein sequences and genomic sequences containing WPP domains. Since the Phage Φ-X174 was sequenced in 1977, the DNA sequences of thousands of organisms have been decoded and stored in databases. This sequence information is analyzed to determine genes that encode proteins, RNA genes, regulatory sequences, structural motifs, and repetitive sequences. A comparison of genes within a species or between different species can show similarities between protein functions, or relations between species (the use of molecular systematics to construct phylogenetic trees). With the growing amount of data, it long ago became impractical to analyze DNA sequences manually. Today[when? ], computer programs such as BLAST are used daily to search sequences from more than 260 000 organisms, containing over 190 billion nucleotides. These programs can compensate for mutations (exchanged, deleted or inserted bases) in the DNA sequence, to identify sequences that are related, but not identical. A variant of this sequence alignment is used in the sequencing process itself. Before sequences can be analyzed they have to be obtained. DNA sequencing is still a non-trivial problem as the raw data may be noisy or afflicted by weak signals. Algorithms have been developed for base calling for the various experimental approaches to DNA sequencing. Most DNA sequencing techniques produce short fragments of sequence that need to be assembled to obtain complete gene or genome sequences. The so-called shotgun sequencing technique (which was used, for example, by The Institute for Genomic Research (TIGR) to sequence the first bacterial genome, Haemophilus influenzae) generates the sequences of many thousands of small DNA fragments (ranging from 35 to 900 nucleotides long, depending on the sequencing technology). The ends of these fragments overlap and, when aligned properly by a genome assembly program, can be used to reconstruct the complete genome. Shotgun sequencing yields sequence data quickly, but the task of assembling the fragments can be quite complicated for larger genomes. For a genome as large as the human genome, it may take many days of CPU time on large-memory, multiprocessor computers to assemble the fragments, and the resulting assembly usually contains numerous gaps that must be filled in later. Shotgun sequencing is the method of choice for virtually all genomes sequenced today[when? ], and genome assembly algorithms are a critical area of bioinformatics research. The first description of a comprehensive genome annotation system was published in 1995  by the team at The Institute for Genomic Research that performed the first complete sequencing and analysis of the genome of a free-living organism, the bacterium Haemophilus influenzae. Owen White designed and built a software system to identify the genes encoding all proteins, transfer RNAs, ribosomal RNAs (and other sites) and to make initial functional assignments. Most current genome annotation systems work similarly, but the programs available for analysis of genomic DNA, such as the GeneMark program trained and used to find protein-coding genes in Haemophilus influenzae, are constantly changing and improving. Following the goals that the Human Genome Project left to achieve after its closure in 2003, a new project developed by the National Human Genome Research Institute in the U.S appeared. The so-called ENCODE project is a collaborative data collection of the functional elements of the human genome that uses next-generation DNA-sequencing technologies and genomic tiling arrays, technologies able to automatically generate large amounts of data at a dramatically reduced per-base cost but with the same accuracy (base call error) and fidelity (assembly error). The core of comparative genome analysis is the establishment of the correspondence between genes (orthology analysis) or other genomic features in different organisms. It is these intergenomic maps that make it possible to trace the evolutionary processes responsible for the divergence of two genomes. A multitude of evolutionary events acting at various organizational levels shape genome evolution. At the lowest level, point mutations affect individual nucleotides. At a higher level, large chromosomal segments undergo duplication, lateral transfer, inversion, transposition, deletion and insertion. Ultimately, whole genomes are involved in processes of hybridization, polyploidization and endosymbiosis, often leading to rapid speciation. The complexity of genome evolution poses many exciting challenges to developers of mathematical models and algorithms, who have recourse to a spectrum of algorithmic, statistical and mathematical techniques, ranging from exact, heuristics, fixed parameter and approximation algorithms for problems based on parsimony models to Markov chain Monte Carlo algorithms for Bayesian analysis of problems based on probabilistic models. Many of these studies are based on the detection of sequence homology to assign sequences to protein families. Pan genomics is a concept introduced in 2005 by Tettelin and Medini which eventually took root in bioinformatics. Pan genome is the complete gene repertoire of a particular taxonomic group: although initially applied to closely related strains of a species, it can be applied to a larger context like genus, phylum etc. It is divided in two parts- The Core genome: Set of genes common to all the genomes under study (These are often housekeeping genes vital for survival) and The Dispensable/Flexible Genome: Set of genes not present in all but one or some genomes under study. A bioinformatics tool BPGA can be used to characterize the Pan Genome of bacterial species. With the advent of next-generation sequencing we are obtaining enough sequence data to map the genes of complex diseases infertility, breast cancer or Alzheimer's Disease. Genome-wide association studies are a useful approach to pinpoint the mutations responsible for such complex diseases. Through these studies, thousands of DNA variants have been identified that are associated with similar diseases and traits. Furthermore, the possibility for genes to be used at prognosis, diagnosis or treatment is one of the most essential applications. Many studies are discussing both the promising ways to choose the genes to be used and the problems and pitfalls of using genes to predict disease presence or prognosis. With the breakthroughs that this next-generation sequencing technology is providing to the field of Bioinformatics, cancer genomics could drastically change. These new methods and software allow bioinformaticians to sequence many cancer genomes quickly and affordably. This could create a more flexible process for classifying types of cancer by analysis of cancer driven mutations in the genome. Furthermore, tracking of patients while the disease progresses may be possible in the future with the sequence of cancer samples. Protein microarrays and high throughput (HT) mass spectrometry (MS) can provide a snapshot of the proteins present in a biological sample. Bioinformatics is very much involved in making sense of protein microarray and HT MS data; the former approach faces similar problems as with microarrays targeted at mRNA, the latter involves the problem of matching large amounts of mass data against predicted masses from protein sequence databases, and the complicated statistical analysis of samples where multiple, but incomplete peptides from each protein are detected. Cellular protein localization in a tissue context can be achieved through affinity proteomics displayed as spatial data based on immunohistochemistry and tissue microarrays. Gene regulation is the complex orchestration of events by which a signal, potentially an extracellular signal such as a hormone, eventually leads to an increase or decrease in the activity of one or more proteins. Bioinformatics techniques have been applied to explore various steps in this process. For example, gene expression can be regulated by nearby elements in the genome. Promoter analysis involves the identification and study of sequence motifs in the DNA surrounding the coding region of a gene. These motifs influence the extent to which that region is transcribed into mRNA. Enhancer elements far away from the promoter can also regulate gene expression, through three-dimensional looping interactions. These interactions can be determined by bioinformatic analysis of chromosome conformation capture experiments. Expression data can be used to infer gene regulation: one might compare microarray data from a wide variety of states of an organism to form hypotheses about the genes involved in each state. In a single-cell organism, one might compare stages of the cell cycle, along with various stress conditions (heat shock, starvation, etc.). One can then apply clustering algorithms to that expression data to determine which genes are co-expressed. For example, the upstream regions (promoters) of co-expressed genes can be searched for over-represented regulatory elements. Examples of clustering algorithms applied in gene clustering are k-means clustering, self-organizing maps (SOMs), hierarchical clustering, and consensus clustering methods. Several approaches have been developed to analyze the location of organelles, genes, proteins, and other components within cells. This is relevant as the location of these components affects the events within a cell and thus helps us to predict the behavior of biological systems. A gene ontology category, cellular compartment, has been devised to capture subcellular localization in many biological databases. Microscopic pictures allow us to locate both organelles as well as molecules. It may also help us to distinguish between normal and abnormal cells, e.g. in cancer. The localization of proteins helps us to evaluate the role of a protein. For instance, if a protein is found in the nucleus it may be involved in gene regulation or splicing. By contrast, if a protein is found in mitochondria, it may be involved in respiration or other metabolic processes. Protein localization is thus an important component of protein function prediction. There are well developed protein subcellular localization prediction resources available, including protein subcellular location databases, and prediction tools. Data from high-throughput chromosome conformation capture experiments, such as Hi-C (experiment) and ChIA-PET, can provide information on the spatial proximity of DNA loci. Analysis of these experiments can determine the three-dimensional structure and nuclear organization of chromatin. Bioinformatic challenges in this field include partitioning the genome into domains, such as Topologically Associating Domains (TADs), that are organised together in three-dimensional space. One example of this is hemoglobin in humans and the hemoglobin in legumes (leghemoglobin), which are distant relatives from the same protein superfamily. Both serve the same purpose of transporting oxygen in the organism. Although both of these proteins have completely different amino acid sequences, their protein structures are virtually identical, which reflects their near identical purposes and shared ancestor. Another aspect of structural bioinformatics include the use of protein structures for Virtual Screening models such as Quantitative Structure-Activity Relationship models and proteochemometric models (PCM). 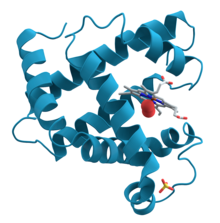 Furthermore, a protein's crystal structure can be used in simulation of for example ligand-binding studies and in silico mutagenesis studies. Network analysis seeks to understand the relationships within biological networks such as metabolic or protein–protein interaction networks. Although biological networks can be constructed from a single type of molecule or entity (such as genes), network biology often attempts to integrate many different data types, such as proteins, small molecules, gene expression data, and others, which are all connected physically, functionally, or both. Interactions between proteins are frequently visualized and analyzed using networks. This network is made up of protein–protein interactions from Treponema pallidum, the causative agent of syphilis and other diseases. Biodiversity informatics deals with the collection and analysis of biodiversity data, such as taxonomic databases, or microbiome data. Examples of such analyses include phylogenetics, niche modelling, species richness mapping, DNA barcoding, or species identification tools. Biological ontologies are directed acyclic graphs of controlled vocabularies. They are designed to capture biological concepts and descriptions in a way that can be easily categorised and analysed with computers. When categorised in this way, it is possible to gain added value from holistic and integrated analysis. The OBO Foundry was an effort to standardise certain ontologies. One of the most widespread is the Gene ontology which describes gene function. There are also ontologies which describe phenotypes. Databases are essential for bioinformatics research and applications. Many databases exist, covering various information types: for example, DNA and protein sequences, molecular structures, phenotypes and biodiversity. Databases may contain empirical data (obtained directly from experiments), predicted data (obtained from analysis), or, most commonly, both. They may be specific to a particular organism, pathway or molecule of interest. Alternatively, they can incorporate data compiled from multiple other databases. These databases vary in their format, access mechanism, and whether they are public or not. The range of open-source software packages includes titles such as Bioconductor, BioPerl, Biopython, BioJava, BioJS, BioRuby, Bioclipse, EMBOSS, .NET Bio, Orange with its bioinformatics add-on, Apache Taverna, UGENE and GenoCAD. To maintain this tradition and create further opportunities, the non-profit Open Bioinformatics Foundation have supported the annual Bioinformatics Open Source Conference (BOSC) since 2000. Some of the platforms giving this service: Galaxy, Kepler, Taverna, UGENE, Anduril, HIVE. In 2014, the US Food and Drug Administration sponsored a conference held at the National Institutes of Health Bethesda Campus to discuss reproducibility in bioinformatics. Over the next three years, a consortium of stakeholders met regularly to discuss what would become BioCompute paradigm. These stakeholders included representatives from government, industry, and academic entities. Session leaders represented numerous branches of the FDA and NIH Institutes and Centers, non-profit entities including the Human Variome Project and the European Federation for Medical Informatics, and research institutions including Stanford, the New York Genome Center, and the George Washington University. It was decided that the BioCompute paradigm would be in the form of digital ‘lab notebooks’ which allow for the reproducibility, replication, review, and reuse, of bioinformatics protocols. This was proposed to enable greater continuity within a research group over the course of normal personnel flux while furthering the exchange of ideas between groups. The US FDA funded this work so that information on pipelines would be more transparent and accessible to their regulatory staff. In 2016, the group reconvened at the NIH in Bethesda and discussed the potential for a BioCompute Object, an instance of the BioCompute paradigm. This work was copied as both a “standard trial use” document and a preprint paper uploaded to bioRxiv. The BioCompute object allows for the JSON-ized record to be shared among employees, collaborators, and regulators. Software platforms designed to teach bioinformatics concepts and methods include Rosalind and online courses offered through the Swiss Institute of Bioinformatics Training Portal. The Canadian Bioinformatics Workshops provides videos and slides from training workshops on their website under a Creative Commons license. The 4273π project or 4273pi project also offers open source educational materials for free. The course runs on low cost Raspberry Pi computers and has been used to teach adults and school pupils. 4273π is actively developed by a consortium of academics and research staff who have run research level bioinformatics using Raspberry Pi computers and the 4273π operating system. MOOC platforms also provide online certifications in bioinformatics and related disciplines, including Coursera's Bioinformatics Specialization (UC San Diego) and Genomic Data Science Specialization (Johns Hopkins) as well as EdX's Data Analysis for Life Sciences XSeries (Harvard). University of Southern California offers a Masters In Translational Bioinformatics focusing on biomedical applications. ^ Lesk, A. M. (26 July 2013). "Bioinformatics". Encyclopaedia Britannica. Retrieved 17 April 2017. ^ a b Sim, A. Y. L.; Minary, P.; Levitt, M. (2012). "Modeling nucleic acids". Current Opinion in Structural Biology. 22 (3): 273–278. doi:10.1016/j.sbi.2012.03.012. PMC 4028509. PMID 22538125. ^ Dawson, W. K.; Maciejczyk, M.; Jankowska, E. J.; Bujnicki, J. M. (2016). "Coarse-grained modeling of RNA 3D structure" (PDF). Methods. 103: 138–156. doi:10.1016/j.ymeth.2016.04.026. PMID 27125734. ^ Kmiecik, S.; Gront, D.; Kolinski, M.; Wieteska, L.; Dawid, A. E.; Kolinski, A. (2016). "Coarse-Grained Protein Models and Their Applications". Chemical Reviews. 116 (14): 7898–936. doi:10.1021/acs.chemrev.6b00163. PMID 27333362. ^ Wong, K. C. (2016). Computational Biology and Bioinformatics: Gene Regulation. CRC Press/Taylor & Francis Group. ISBN 9781498724975. ^ Joyce, A. P.; Zhang, C.; Bradley, P.; Havranek, J. J. (2015). "Structure-based modeling of protein: DNA specificity". Briefings in Functional Genomics. 14 (1): 39–49. doi:10.1093/bfgp/elu044. PMC 4366589. PMID 25414269. ^ Spiga, E.; Degiacomi, M. T.; Dal Peraro, M. (2014). "New Strategies for Integrative Dynamic Modeling of Macromolecular Assembly". In Karabencheva-Christova, T. (ed.). Biomolecular Modelling and Simulations. Advances in Protein Chemistry and Structural Biology. 96. Academic Press. pp. 77–111. doi:10.1016/bs.apcsb.2014.06.008. ISBN 9780128000137. PMID 25443955. ^ Ciemny, Maciej; Kurcinski, Mateusz; Kamel, Karol; Kolinski, Andrzej; Alam, Nawsad; Schueler-Furman, Ora; Kmiecik, Sebastian (4 May 2018). "Protein–peptide docking: opportunities and challenges". Drug Discovery Today. 23 (8): 1530–1537. doi:10.1016/j.drudis.2018.05.006. ISSN 1359-6446. PMID 29733895. ^ a b Hogeweg P (2011). Searls, David B. (ed.). "The Roots of Bioinformatics in Theoretical Biology". PLoS Computational Biology. 7 (3): e1002021. Bibcode:2011PLSCB...7E2021H. doi:10.1371/journal.pcbi.1002021. PMC 3068925. PMID 21483479. ^ Hogeweg P (1978). "Simulating the growth of cellular forms". Simulation. 31 (3): 90–96. doi:10.1177/003754977803100305. ^ Moody, Glyn (2004). Digital Code of Life: How Bioinformatics is Revolutionizing Science, Medicine, and Business. ISBN 978-0-471-32788-2. ^ Eck RV, Dayhoff MO (1966). "Evolution of the structure of ferredoxin based on living relics of primitive amino Acid sequences". Science. 152 (3720): 363–6. Bibcode:1966Sci...152..363E. doi:10.1126/science.152.3720.363. PMID 17775169. ^ Johnson G, Wu TT (January 2000). "Kabat Database and its applications: 30 years after the first variability plot". Nucleic Acids Res. 28 (1): 214–218. doi:10.1093/nar/28.1.214. PMC 102431. PMID 10592229. ^ Attwood TK, Gisel A, Eriksson NE, Bongcam-Rudloff E (2011). "Concepts, Historical Milestones and the Central Place of Bioinformatics in Modern Biology: A European Perspective". Bioinformatics - Trends and Methodologies. Bioinformatics – Trends and Methodologies. InTech. doi:10.5772/23535. ISBN 978-953-307-282-1. Retrieved 8 January 2012. ^ Benson DA, Karsch-Mizrachi I, Lipman DJ, Ostell J, Wheeler DL (January 2008). "GenBank". Nucleic Acids Res. 36 (Database issue): D25–30. doi:10.1093/nar/gkm929. PMC 2238942. PMID 18073190. ^ a b c Fleischmann RD, Adams MD, White O, Clayton RA, Kirkness EF, Kerlavage AR, Bult CJ, Tomb JF, Dougherty BA, Merrick JM (July 1995). "Whole-genome random sequencing and assembly of Haemophilus influenzae Rd". Science. 269 (5223): 496–512. Bibcode:1995Sci...269..496F. doi:10.1126/science.7542800. PMID 7542800. ^ Carvajal-Rodríguez A (2012). "Simulation of Genes and Genomes Forward in Time". Current Genomics. 11 (1): 58–61. doi:10.2174/138920210790218007. PMC 2851118. PMID 20808525. ^ Brown, TA (2002). "Mutation, Repair and Recombination". Genomes (2nd ed.). Manchester (UK): Oxford. ^ Carter, N. P.; Fiegler, H.; Piper, J. (2002). "Comparative analysis of comparative genomic hybridization microarray technologies: Report of a workshop sponsored by the Wellcome trust". Cytometry Part A. 49 (2): 43–8. doi:10.1002/cyto.10153. PMID 12357458. ^ Aston KI (2014). "Genetic susceptibility to male infertility: News from genome-wide association studies". Andrology. 2 (3): 315–21. doi:10.1111/j.2047-2927.2014.00188.x. PMID 24574159. ^ Véron A, Blein S, Cox DG (2014). "Genome-wide association studies and the clinic: A focus on breast cancer". Biomarkers in Medicine. 8 (2): 287–96. doi:10.2217/bmm.13.121. PMID 24521025. ^ Tosto G, Reitz C (2013). "Genome-wide association studies in Alzheimer's disease: A review". Current Neurology and Neuroscience Reports. 13 (10): 381. doi:10.1007/s11910-013-0381-0. PMC 3809844. PMID 23954969. ^ Londin E, Yadav P, Surrey S, Kricka LJ, Fortina P (2013). Use of Linkage Analysis, Genome-Wide Association Studies, and Next-Generation Sequencing in the Identification of Disease-Causing Mutations. Pharmacogenomics. Methods in Molecular Biology. 1015. pp. 127–46. doi:10.1007/978-1-62703-435-7_8. ISBN 978-1-62703-434-0. PMID 23824853. ^ Hindorff, L.A.; et al. (2009). "Potential etiologic and functional implications of genome-wide association loci for human diseases and traits". Proc. Natl. Acad. Sci. USA. 106 (23): 9362–9367. Bibcode:2009PNAS..106.9362H. doi:10.1073/pnas.0903103106. PMC 2687147. PMID 19474294. ^ Hall, L.O. (2010). Finding the right genes for disease and prognosis prediction. System Science and Engineering (ICSSE),2010 International Conference. pp. 1–2. doi:10.1109/ICSSE.2010.5551766. ISBN 978-1-4244-6472-2. ^ Vazquez, Miguel; Torre, Victor de la; Valencia, Alfonso (27 December 2012). "Chapter 14: Cancer Genome Analysis". PLOS Computational Biology. 8 (12): e1002824. Bibcode:2012PLSCB...8E2824V. doi:10.1371/journal.pcbi.1002824. ISSN 1553-7358. PMC 3531315. PMID 23300415. ^ Hye-Jung, E.C. ; Jaswinder, K.; Martin, K.; Samuel, A.A; Marco, A.M (2014). "Second-Generation Sequencing for Cancer Genome Analysis". In Dellaire, Graham; Berman, Jason N.; Arceci, Robert J. (eds.). Cancer Genomics. Boston (US): Academic Press. pp. 13–30. doi:10.1016/B978-0-12-396967-5.00002-5. ISBN 9780123969675. ^ Grau, J.; Ben-Gal, I.; Posch, S.; Grosse, I. (1 July 2006). "VOMBAT: prediction of transcription factor binding sites using variable order Bayesian trees" (PDF). Nucleic Acids Research. 34 (Web Server): W529–W533. doi:10.1093/nar/gkl212. PMC 1538886. PMID 16845064. ^ "The Human Protein Atlas". www.proteinatlas.org. Retrieved 2 October 2017. ^ "The human cell". www.proteinatlas.org. Retrieved 2 October 2017. ^ Thul, Peter J.; Åkesson, Lovisa; Wiking, Mikaela; Mahdessian, Diana; Geladaki, Aikaterini; Blal, Hammou Ait; Alm, Tove; Asplund, Anna; Björk, Lars (26 May 2017). "A subcellular map of the human proteome". Science. 356 (6340): eaal3321. doi:10.1126/science.aal3321. PMID 28495876. ^ Ay, Ferhat; Noble, William S. (2 September 2015). "Analysis methods for studying the 3D architecture of the genome". Genome Biology. 16 (1): 183. doi:10.1186/s13059-015-0745-7. PMC 4556012. PMID 26328929. ^ Hoy, JA; Robinson, H; Trent JT, 3rd; Kakar, S; Smagghe, BJ; Hargrove, MS (3 August 2007). "Plant hemoglobins: a molecular fossil record for the evolution of oxygen transport". Journal of Molecular Biology. 371 (1): 168–79. doi:10.1016/j.jmb.2007.05.029. PMID 17560601. ^ a b "Open Bioinformatics Foundation: About us". Official website. Open Bioinformatics Foundation. Retrieved 10 May 2011. ^ "Open Bioinformatics Foundation: BOSC". Official website. Open Bioinformatics Foundation. Retrieved 10 May 2011. ^ Brohée, Sylvain; Barriot, Roland; Moreau, Yves (2010). "Biological knowledge bases using Wikis: combining the flexibility of Wikis with the structure of databases". Bioinformatics. 26 (17): 2210–2211. doi:10.1093/bioinformatics/btq348. PMID 20591906. Retrieved 5 May 2015. ^ Nisbet, Robert (14 May 2009). "BIOINFORMATICS". Handbook of Statistical Analysis and Data Mining Applications. John Elder IV, Gary Miner. Academic Press. p. 328. ISBN 9780080912035. Retrieved 9 May 2014. ^ Commissioner, Office of the. "Advancing Regulatory Science - Sept. 24-25, 2014 Public Workshop: Next Generation Sequencing Standards". www.fda.gov. Retrieved 30 November 2017. ^ Simonyan, Vahan; Goecks, Jeremy; Mazumder, Raja (2017). "Biocompute Objects—A Step towards Evaluation and Validation of Biomedical Scientific Computations". PDA Journal of Pharmaceutical Science and Technology. 71 (2): 136–146. doi:10.5731/pdajpst.2016.006734. ISSN 1079-7440. PMC 5510742. PMID 27974626. ^ Commissioner, Office of the. "Advancing Regulatory Science - Community-based development of HTS standards for validating data and computation and encouraging interoperability". www.fda.gov. Retrieved 30 November 2017. ^ Alterovitz, Gil; Dean, Dennis A.; Goble, Carole; Crusoe, Michael R.; Soiland-Reyes, Stian; Bell, Amanda; Hayes, Anais; King, Charles Hadley S.; Johanson, Elaine (4 October 2017). "Enabling Precision Medicine via standard communication of NGS provenance, analysis, and results". bioRxiv 191783. ^ Barker, D; Ferrier, D.E.K. ; Holland, P.W; Mitchell, J.B.O; Plaisier, H; Ritchie, M.G; Smart, S.D. (2013). "4273π : bioinformatics education on low cost ARM hardware". BMC Bioinformatics. 14: 243. doi:10.1186/1471-2105-14-243. PMC 3751261. PMID 23937194. ^ Barker, D; Alderson, R.G; McDonagh, J.L; Plaisier, H; Comrie, M.M; Duncan, L; Muirhead, G.T.P; Sweeny, S.D. (2015). "University-level practical activities in bioinformatics benefit voluntary groups of pupils in the last 2 years of school". International Journal of STEM Education. 2 (17). doi:10.1186/s40594-015-0030-z. ^ McDonagh, J.L; Barker, D; Alderson, R.G. (2016). "Bringing computational science to the public". SpringerPlus. 5 (259): 259. doi:10.1186/s40064-016-1856-7. PMC 4775721. PMID 27006868. ^ Robson, J.F. ; Barker, D (2015). "Comparison of the protein-coding gene content of Chlamydia trachomatis and Protochlamydia amoebophila using a Raspberry Pi computer". BMC Research Notes. 8 (561): 561. doi:10.1186/s13104-015-1476-2. PMC 4604092. PMID 26462790. ^ Wregglesworth, K.M; Barker, D (2015). "A comparison of the protein-coding genomes of two green sulphur bacteria, Chlorobium tepidum TLS and Pelodictyon phaeoclathratiforme BU-1". BMC Research Notes. 8 (565): 565. doi:10.1186/s13104-015-1535-8. PMC 4606965. PMID 26467441. Sehgal et al. : Structural, phylogenetic and docking studies of D-amino acid oxidase activator(DAOA ), a candidate schizophrenia gene. Theoretical Biology and Medical Modelling 2013 10 :3. Gilbert D (2004). "Bioinformatics software resources". Briefings in Bioinformatics. 5 (3): 300–304. doi:10.1093/bib/5.3.300. PMID 15383216.